This little cutie pie is on her way to a new home. I try not to get attached to the toys I sell, but she really is special. I hope her new owner will love her too (she's a Valentine's Day present, so the odds are good). 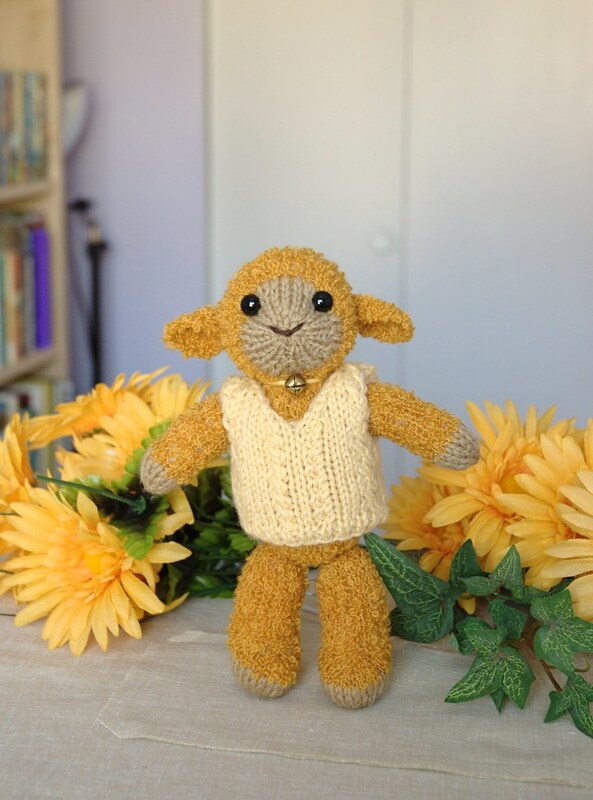 I have more of the curly yellow yarn, enough to make another lamb, I hope. The next one might be staying with me. I'm working my way through the first of my commissions for this spring. Of the 10 toys, I have only 3 left to knit, and 5 to put together. With some determination, I'll have them all done by this time next week. Then I start on the next one, for 6 toys. After that I have some smaller ones. I tried to space those out a bit, to give me time to work on patterns. I've been working away on the cow whenever I need a break from bunnies, so it's coming along, slowly. I keep changing my mind about what I want it to look like, which isn't helping. I've written out a draft for my long-awaited face tutorial. Looking at the length of the text, and thinking about how many photos I need to include, the face tutorial will probably be expanded into a mini-series. Each part of the face will be covered in a separate tutorial, spaced over several days. This way I can get as much detail as I want into each part, without making one enormously long post. My hubby suggested the idea of making video clips to go along with the tutorials, which I'm a bit hesitant about. I mean, I love the idea in theory, because it will be much clearer what I'm doing. But there are two problems: one, we don't have a video camera, and two, I have this irrational fear that I sound like a 6-year-old. However, the chances are good that my husband will talk me into us getting a video camera. He's also done a bunch of narrating for videos, so he can coach me in the talking part. Who knows, maybe in some bizarre way me sounding like a 6-year-old will just add to the cuteness factor of my toys. February 6, 2008 at 12:22 p.m.
looking forward to the face tutorial! sounds like its going to be great. February 7, 2008 at 2:00 a.m.